DECLÉOR DEEP CLEANSING MASK Clarifying clay mask with White Clay & Herbs 50ml is a creamy facial mask enriched with fruit and plant extracts for a fresh, purified and softened complexion. Suitable for oily and combination skin types, it dissolves all impurities and helps cleanse the skin without dehydrating, whilst refining skin texture. Active Ingredients: White Clay, Chamomile, Ginseng. Skin Type: Oily Skin, Combination Skin. Treatment Type: Weekly Facial Mask. 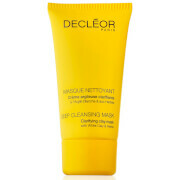 Previously called DECLÉOR AROMA CLEANSE Clay and herbal cleansing mask 50ml. DECLÉOR DEEP CLEANSING MASK Clarifying clay mask with White Clay & Herbs 50ml was found on 6 websites and was price compared using EAN: 3395012002140. The cheapest DECLÉOR DEEP CLEANSING MASK Clarifying clay mask with White Clay & Herbs 50ml is shown as the main item, prices range from £19.95 to £30.00, excluding delivery. Price comparison based on price and delivery charges, with any valid discount codes being applied, is shown in the table above. Prices and information correct at the time of publication.